Our everyday actions continue to make demands upon our planet’s finite natural resources. Without successful conservation measures it is inevitable that we will leave behind a poorer planet. Only last year we witnessed the extinction of the Yangtze River dolphin, the first extinction of a mammal contributed to man’s changes upon natural environments. 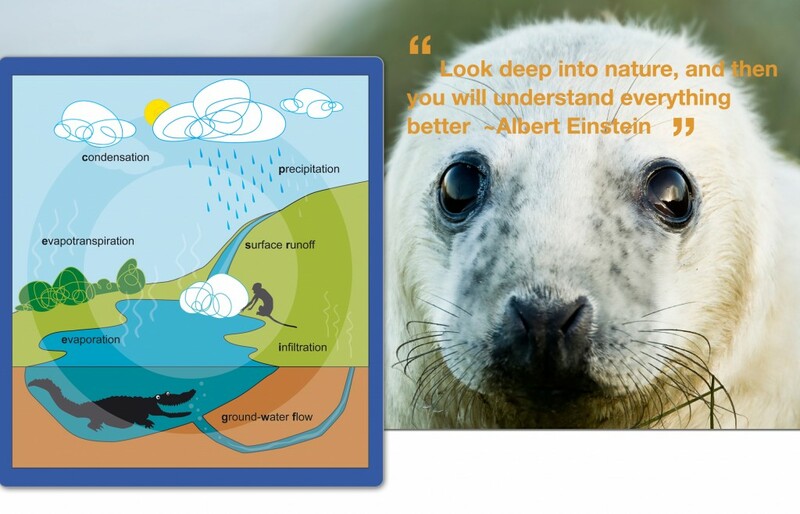 It is essential that we educate both today’s and tomorrow’s generation to ensure that we work together to conserve our fragile planet and understand the intrinsic connection between our everyday actions and how they ultimately affect the planet, people, animals and all living things. Exciting hands-on educational activities, supported by Yebo volunteers, will involve young people in the day to day work of conservation projects enabling young people to experience working with wildlife, inspirational project staff and projects wishing to promote an understanding of conservation in an easy-to-understand manner. By supporting conservation projects around the globe, Yebo believes that by connecting both local and international young people to the very projects working to promote conservation and raise awareness of beneficial conservation actions, we can all work together to ensure that tomorrow’s generation can indeed experience the same planet we enjoy today. 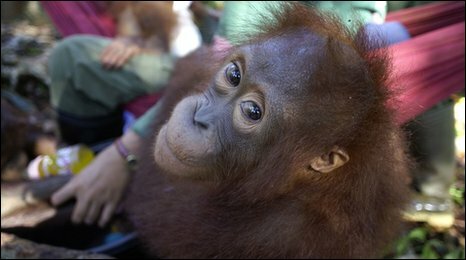 The challenge of saving the orangutan – man’s closest relative – from extinction is trickling down to the weekly shop. Many of the biscuits, margarines, breads, crisps and even bars of soap that consumers pick off supermarket shelves contain an ingredient that is feeding a growth industry that conservationists say is killing the orangutans. The mystery ingredient in the mix is palm oil – the cheapest source of vegetable oil available – and one that rarely appears on the label of most products. 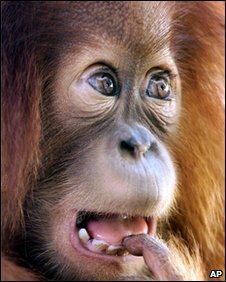 Palm oil is grown on land that was once home to the vast rainforests of Borneo, and the natural habitat of the orangutan. The International Union for Conservation of Nature estimates that the population has declined by 50% in recent decades and the Indonesian government admits that 50,000 orangutans have died as a result of de-forestation. 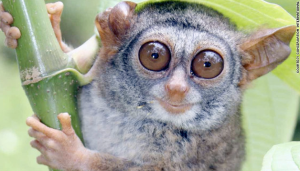 A BBC Panorama investigation into clear-cutting in Indonesian Borneo – the island it shares with Malaysia – found that the thirst for land on which to plant palm plantations is encroaching on areas that the Indonesian government has deemed to be off-limits. The orangutans, displaced as the trees of old-growth forests are burned and at times killed by workers who see them as a nuisance in the logging process, are not the only victims of the runaway growth in palm oil – scientists say there is a wider environmental price being paid. Greenpeace has identified the draining of ancient peat lands to make way for palm oil as a global threat, saying it had lead to massive amounts of trapped methane and carbon dioxide being released into the atmosphere. As a result, Indonesia is the world’s third largest emitter of greenhouse gases, behind only America and China. Using GPS technology and satellite imaging, the BBC team pinpointed exact locations where palm oil giant the Duta Palma Group is logging on both high conservation lands and deep peat lands – both are illegal. Shailendra Yashwant, Greenpeace director for Southeast Asia, said this illegal logging is widespread and includes major suppliers to the UK’s food and household product market. He said the wider environmental issue of greenhouse gases can no longer be overlooked by both manufacturers and everyday consumers. The palm industry – valued at £5bn ($7.7bn) for Indonesia – is the country’s third biggest export earner. Many of the big manufacturers who buy that oil via European wholesalers say that while they are starting to find oil from sustainable sources, they are not yet in a position to trace the origin of all of the oil they use. Currently, only 3% of the world’s palm oil is certified sustainable, meaning it comes from plantations that pass an environmental and social impact test. Many have joined the Roundtable on Sustainable Palm Oil (RSPO) scheme set up to promote certification of where palm oil originates. Others have set ambitious goals to use sustainable oil by 2015 or earlier, but Greenpeace’s Shailendra Yashwant said the RSPO amounts to a “greenwash” because those commitments are unenforceable on the ground. Bulk oil from a variety of plantations – including that of Duta Palma Group that the BBC found to be illegally clear-cutting – is mixed together and shipped around the world and sold on to manufacturers behind everyday products. Duta Palma declined to comment on the BBC’s evidence of illegal deforestation. Hilary Benn, the Secretary of State for the Environment, Food and Rural Affairs, told Panorama the time is right for consumers to put pressure on manufacturers, demanding to know which of their products contain palm oil and assurances that it comes from a sustainable source. Current labelling laws allow manufacturers to list palm oil as ‘vegetable’ oil, without singling out the palm oil content. Many manufacturers, including industry giants Unilever and Proctor and Gamble, say their recipes can change and the amounts and types of oils they use can vary from week to week, making more detailed labels unworkable. However, Sainsbury’s supermarkets had earlier taken the decision to not only single out palm oil on the ingredients lists of their own-brand products, but to state directly that it is from a sustainable source. Recently Unilever, the UK’s largest user of palm oil in products that range from Dove soap to Pot Noodles, Knorr soups and Flora, terminated a large contract with a supplier called Sinar Mas, because of reports it was destroying high conservation value forests. Unilever has told Panorama that while it may have used oil from Duta Palma in the past, it intends to overcome its supply system problems so that it no longer uses oil from the producer. Secretary Benn said: “I think it’s really about what consumers can do because the most powerful message that can be sent to companies is from their consumers about what it is they want to buy,” he told reporter Raphael Rowe, citing the demand for free range eggs in the UK as an example of consumer influence. Mr Benn said the participation by UK retailers and manufacturers in the Roundtable on Sustainable Palm Oil is a step towards ensuring that palm oil is traceable and therefore increases the chances that it can be certified sustainable. Panorama: Dying for a Biscuit, BBC One, Monday, 22 February at 2030GMT. 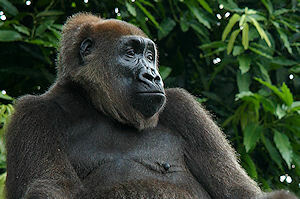 which are the most in need of urgent conservation action. Cat Ba in the Gulf of Tonkin, north-eastern Vietnam, where just 60 to 70 individuals remain. 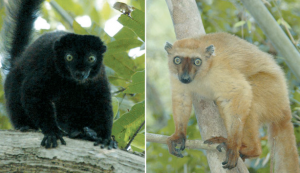 Similarly, there are thought to be less than 100 individual northern sportive lemurs (Lepilemur septentrionalis) left in Madagascar, and around 110 eastern black crested gibbons (Nomascus nasutus) in northeastern Vietnam. 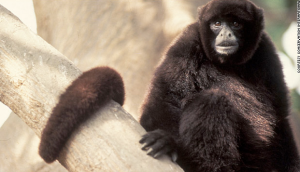 Almost half (48 percent) of the world’s 634 primate species are classified as threatened with extinction on the IUCN Red List of Threatened Species™. The main threats are habitat destruction, particularly from the burning and clearing of tropical forests (which results in the release of around 16 percent of the global greenhouse gases causing climate change), the hunting of primates for food, and the illegal wildlife trade. lion tamarin (Leontopithecus chrysopygus) was down listed to Endangered from Critically Endangered on the IUCN Red List, as was the golden lion tamarin (Leontopithecus rosalia) in 2003, as a result of three decades of conservation efforts involving numerous institutions, many of which were zoos. 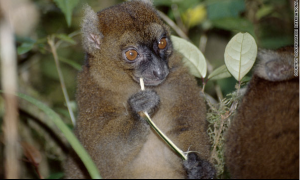 Populations of both animals are now well-protected but remain very small, indicating an urgent need for reforestation to provide new habitat for their long-term survival. 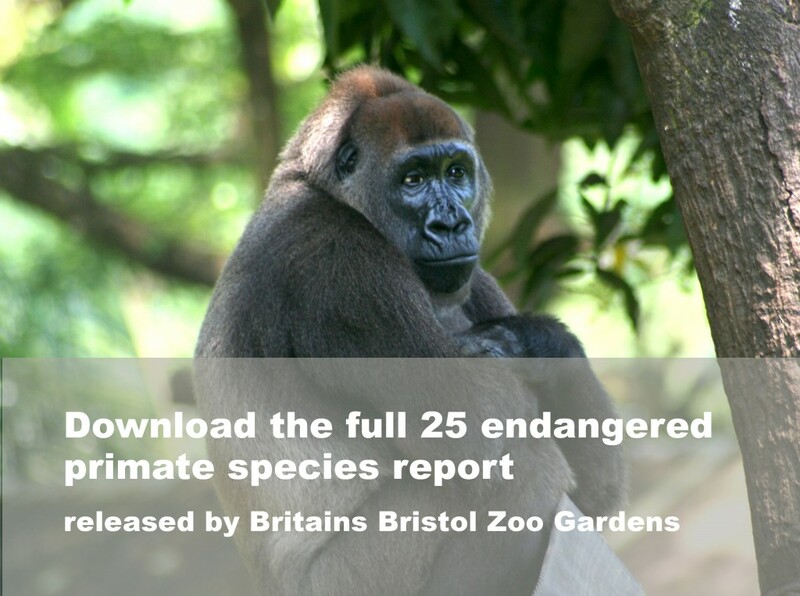 Primates in Peril: The World’s 25 Most Endangered Primates, 2008–2010 has been compiled by the Primate Specialist Group of IUCN’s Species Survival Commission (SSC) and the International Primatological Society (IPS), in collaboration with Conservation International (CI). The IUCN Species Programme supports the activities of the IUCN Species Survival Commission (SSC) and individual Specialist Groups, as well as implementing global species conservation initiatives. It is an integral part of the IUCN Secretariat and is managed from IUCN’s international headquarters in Gland, Switzerland. It includes a number of technical units covering Species Trade and Use, Red List, Freshwater Biodiversity Assessment, (all located in Cambridge, UK), and the Global Biodiversity Assessment Initiative (located in Washington DC, USA). 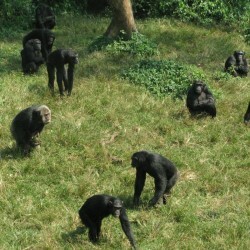 The world’s first film shot entirely by chimpanzees is broadcast by the BBC as part of a natural history documentary. The apes created the movie using a specially designed chimp-proof camera given to them by primatologists. 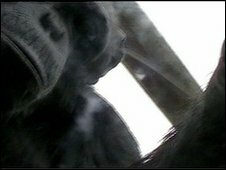 The film-making exercise is part of a scientific study into how chimpanzees perceive the world and each other. 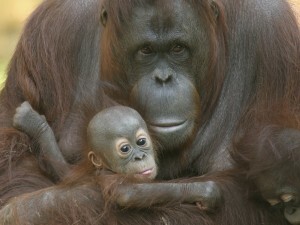 It will be screened within the Natural World programme “Chimpcam” shown on BBC Two at 2000GMT on Wednesday 27 January. 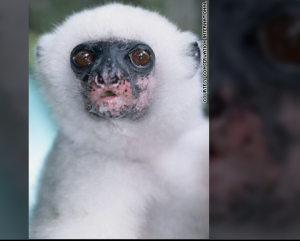 Making the movie was the brainchild of primatologist Ms Betsy Herrelko, who is studying for a PhD in primate behaviour at the University of Stirling, UK. Over 18 months, she introduced video technology to a group of 11 chimpanzees living in a newly built enclosure at Edinburgh Zoo, UK. The enclosure, which contains three large interlinked outdoor arenas, as well as a series of smaller rooms in which the apes can be studied by researchers, is the largest of its kind in the world. Despite the fact that the chimps had never taken part in a research project before, they soon displayed an interest in film-making. Ms Herrelko set the chimps two challenges. The first was to teach the chimps how to use a touchscreen to select different videos. By doing so, Ms Herrelko could investigate which types of images chimps prefer to watch. 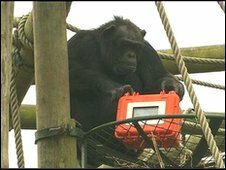 The second challenge was to give the apes a “Chimpcam”, a recording camera housed in a chimp-proof box. On top of the box was a video screen that showed live images of whatever the camera was pointing at. Initially, the chimps were more interested in each other than the video technology, as two male chimps within the study group vied to become the alpha male, disrupting the experiment. 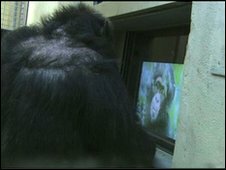 But over time, some of the chimps learned how to select different videos to watch. For example, the chimps could use a touchscreen to decide whether to watch footage of their outside enclosure, or the food preparation room, where zoo staff prepare the chimps’ meals. The results still have to be analysed in detail, but it seems the chimps did not prefer to watch any of these images over the others. Ms Herrelko is not sure why, but it could be that the images shown were too familiar to the chimps or because they have no way of asking to see something different. Then in the final the final stage of her work, she investigated what happened when she gave the Chimpcam to the whole group. Gradually, the chimps started playing with the Chimpcam, carrying it around the enclosure. The chimps soon became interested in the camera view screen on the Chimpcam box, watching what happened as they moved the Chimpcam around filming new images. Overall, they were more interested in the Chipcam viewfinder than they were the touchscreen in the research room. The apes are unlikely to have actively tried to film any particular subject, or understand that by carrying Chimpcam around, they were making a film. However, the result, as well as providing new information on how chimps like to see the world, may yet go down in television history. As we drive through central Sumatra, what looks like a scene from some apocalyptic movie where an unknown force has obliterated all life on earth unfolds before us. The land is tinted a sick gray. Some parts still smolder. Twisted hulks of tree trunks take on abnormal shapes. A dark black canal cuts perfectly through. It’s nearly impossible to imagine that this was once lush tropical rainforest. In other parts as far as the eye can see, a sea of emerald green. But the rolling hills are not covered in natural forest — instead they’re covered in palm plantations. Their emerald green color splashed across rolling hills give the impression that this is untouched nature. But the deafening silence inside the plantations are a clear indication that they are lifeless ecosystems, part of a global factory churning out one of the most in-demand products out there — palm oil. 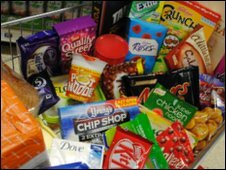 In supermarkets across the world products containing palm oil regularly fly off the shelves — soaps, chocolates, margarine, cosmetics. Most consumers have no idea that they contain palm oil which often hides behind the label of “vegetable oil” and even less of a clue that conservationists are singling it out as being one of the main driving forces behind deforestation. Clearing forests for agriculture isn’t exactly new, but palm is quickly becoming the crop of choice. It is fast growing with high yields — global demand now tops 40 million tonnes a year and is central to the economies of Malaysia and Indonesia. But the rampant tearing down of Indonesia’s natural forests have made this tropical nation the world’s third largest contributor to greenhouse gas emissions. 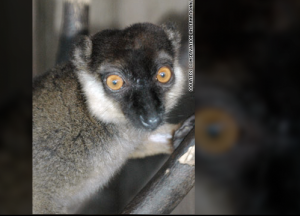 Already, 85 percent of Sumatra’s forests are gone and what is left is disappearing at an alarming rate. “We are running out of time here, we are at the end of the tunnel,” Peter Pratje with the Frankfurt Zoological Society tells us at an orangutan sanctuary in the heart of Sumatra. Sumatran orangutans are expected to be the first great ape to become extinct — due to the loss of their natural habitat, just one of many species threatened because of unchecked deforestation. It’s a reality that even the largest buyers and producers of palm oil acknowledge. 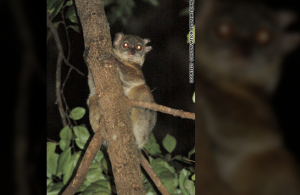 Conservationists say that its time for companies to control their desire for more money, governments to start seriously enforcing forest protection laws and individual consumers to take on responsibility and make lifestyle changes. For Sumatra, it might already be too late. A group of chimpanzees have been captured on camera apparently lost in grief for the death of a friend. More than a dozen apes watched in silence from their enclosure in Cameroon as the body of Dorothy, a chimp in her 40s, was wheeled past for burial. 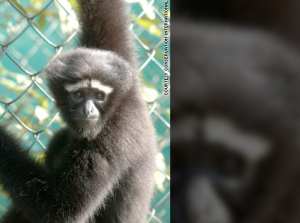 Dorothy, who died of heart failure, was described as a “prominent figure” within the group of about 25 chimps at the Sanaga-Yong Chimpanzee Rescue Centre. The photo was taken by 30-year-old Monica Szczupider. She was working at the centre, which cares for orphaned animals whose mothers were killed for the illegal bushmeat trade. “We were burying Dorothy,” she said. “We brought her in the wheelbarrow to let the others see. “I cannot emphasise enough how silent and still they were. Chimpanzees are typically not like that. The following article was taken from cosmic log by Alan boyle. Empathy is sometimes defined by psychologists as a high-level cognitive feat – you put yourself in the shoes of somebody else. But actually, the core of empathy is an emotional tie between A and B: You see someone crying and this makes you feel sad. I see you smiling and that makes me happy, or I smile myself. That’s a very basic connection you can observe in many other animals. I’m not saying that you will necessarily see it in fish or birds, or reptiles, but certainly in mammals. There are now even studies in rodents indicating this capacity. When you get to our closer relatives, you get to more complex relationships that are more similar to ours. They’re not just connected with each other and affected by each other’s emotions. They are also interested in figuring out what is going on with the other and understanding it, and maybe helping in a particular way. And so in the primates especially, our close relatives, you get more forms of behavior that are more similar to what we call empathy. Emory University primatologist Frans de Waal presents fresh evidence that our empathethic behavior is rooted in hard-wired habits that can be seen among chimpanzees, our closest relatives in the animal world, as well as in far-removed species such as mice. 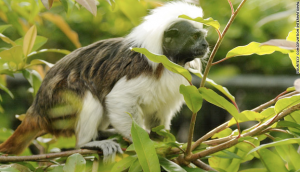 For decades, de Waal has conducted eye-opening research into how monkeys and apes find ways to share their food, share affection and mirror eachothers behaviour. His studies of chimps have pointed to the origin of our languages and our moral code as well. When it comes to getting along with each other, de Waal makes it clear we could learn a thing or two from the chimps. There was a juvenile chimpanzee at a zoo in Sweden who had a rope wrapped twice around its neck, and was choking. It was basically going to die. So the highest-ranking male of the group, the alpha male, came over and lifted the juvenile up with one arm to take the pressure off the rope. With his free hand, the alpha male unwrapped the rope carefully from the neck of the juvenile and then released the juvenile. He basically saved his life. That’s interesting, because that’s a form of empathy and altruism where not only is this male emotionally affected – otherwise he would not have taken the action, of course – but he has the intelligence to do the right thing. Instead of pulling at the juvenile, which would have killed him, he finds an intelligent solution. And in order to do that, he needs to understand what is happening to the other and what the solution is going to be. 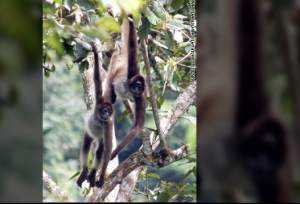 When monkeys drum, they activate brain networks linked with communication, new findings that suggest a common origin of primate vocal and nonvocal communication systems and shed light on the origins of language and music. In the wild, monkeys known as macaques drum by shaking branches or thumping on dead logs. 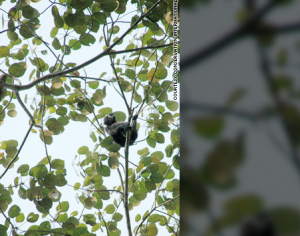 Similar behavior has been seen in non-human primates — for instance, gorillas beat their chests and clap their hands, while chimpanzees drum on tree buttresses. Yebo believes that tomorrow’s generation should grow up experiencing the same fascinating planet that we all enjoy today.